Posted December 28, 2009 by Emmet Farrell in Features. Infestation with head lice is common and affects schoolchildren usually at ages 5 to 11 years. Girls are more likely to be affected than boys. 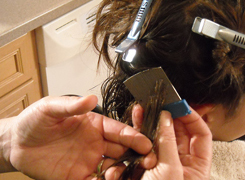 Transmission is by head to head contact, as the lice cannot fly or jump but can crawl quickly. Sharing of personal items such as brushes, combs or hats can possibly spread the head louse. 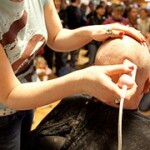 Shaven heads and hair gels act as a physical deterrent. Itching is the most common symptom, the louse feeds by sucking blood and injecting saliva, thus causing an itch. The head louse is a pale reddish-brown insect; most infestations consist of less than 10 lice. A fine-toothed comb should be used to aid detection of live lice. Special attention should be paid to the area near the ears and nape of the neck where most of the eggs are laid. It is appropriate to start treatment as soon as possible after the diagnosis has been made. There are two basic treatment options for which there is some scientific evidence of efficacy: (1) topical insecticides, e.g. Malathion, permethrin and phenothrin, and (2) wet combing. Herbal products containing tea tree oil, battery powered combs and other shampoos are also used to help treat and prevent infestation. Wet combing used in addition to insecticides provides the best attack on an infestation. The rationale behind wet combing is that lice do not move to another host within 7 days of hatching and do not reproduce within 10 days of hatching. Therefore, if all young lice are combed out within a few days the infestation can be eradicated. It is done with wet hair and added lubricant (e.g. hair conditioner) and continued until no lice are found. Combing is repeated every three days and should be continued for two weeks after initial infestation is detected. Open late Monday to Friday 9am to 8pm.Sat.9am to 7pm.